The limit of the human race’s stair-climbing tolerance seems to be six floors. The will to buy seems to be unlimited. 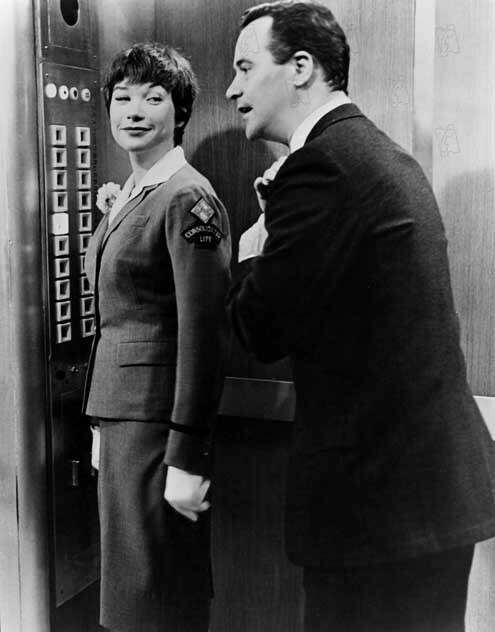 So it’s only natural the very first elevators and escalators turned up in department stores. My first memory of riding an escalator is in a department store, and I bet that’s the same for many of us. What kid doesn’t worry about getting trapped underneath one of those stairs that disappears under the floor, or wonder where those stairs go and how they start out new at the top? People have been trying to figure out how to get from one place to another without using any effort since we learned to stand upright on two feet — especially when we had to lug stuff. In ancient Greece, Archimedes figured out a system of ropes and pulleys for hoisting stuff. 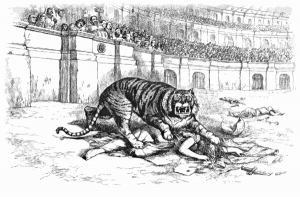 In the Coliseums of A.D. 80, rope and pulley devices were used to bring wild animals up to the arena where they’d be slaughtered by gladiators. At least the animals didn’t have to climb up any stairs before sacrificing their lives for the entertainment of others. A famous hoisting device in medieval times was a basket used at the monastery of St. Barlaam in Greece, which stood on a peak about 200 feet above the ground. 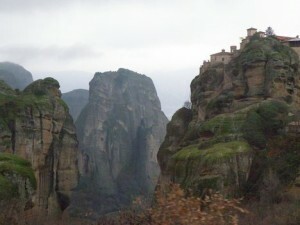 This was the only way supplies could get up to the monastery or down. That monastery is now on the market at rock bottom prices. 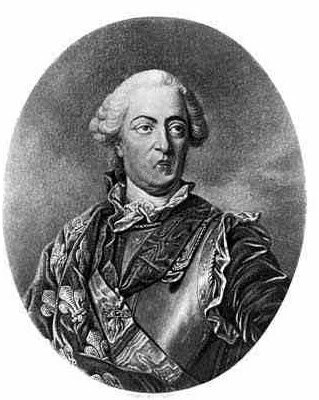 In 1743 King Louis XV had a “flying chair”that could take him from the balcony of his palace bedroom up one flight. This was operated by manpower, with his servants raising or lowering him as he desired. He’s lucky they didn’t tell him to take a flying leap off his balcony instead. Elisha Graves Otis invented one of the first functional passenger elevators, and that was installed in a five-story department store owned by E.W Haughtwhat & Company of Manhattan in 1857. His sons later went on to buy up a bunch of patents and pull off a bunch of mergers to make the Otis Elevator Company the premier people-moving empire it is today. 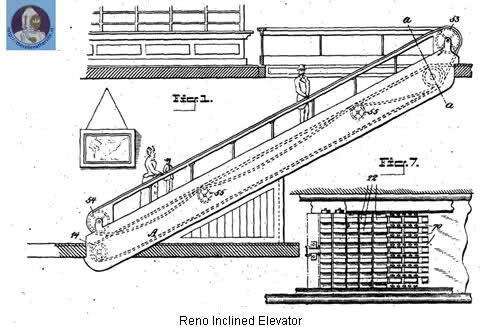 One of the first big names to come on the scene with an actual working escalator was Jesse Reno, who created an “inclined elevator” as a novelty ride by the Old Iron Pier at Coney Island in 1896. Passengers traveled on a conveyer belt at a 25 degree angle. Fun! By the 1870s in New York City, where a limited amount of space has always pressured everyone to build up rather than out, the Otis brothers made it possible to crowd people into metal boxes that traveled straight up with their hydraulic passenger elevators. Eventually they made listening to musak while breathing in your neighbor’s bad breath something everyone could enjoy in skyscrapers across the country. At least we weren’t being delivered to arenas to be murdered for the entertainment of others but only going, for the most part, to boring office jobs. 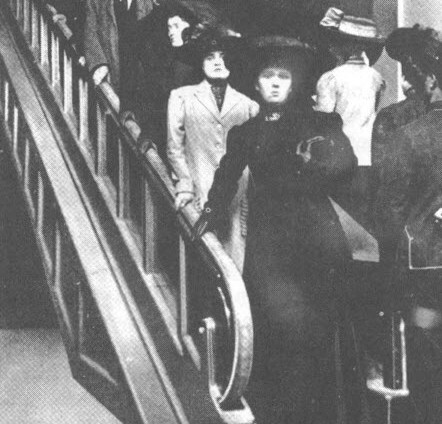 In 1898 Bloomingdale’s Department Store on Third Avenue and 59th financed Reno to design what became the first escalator used for retail. Clever! 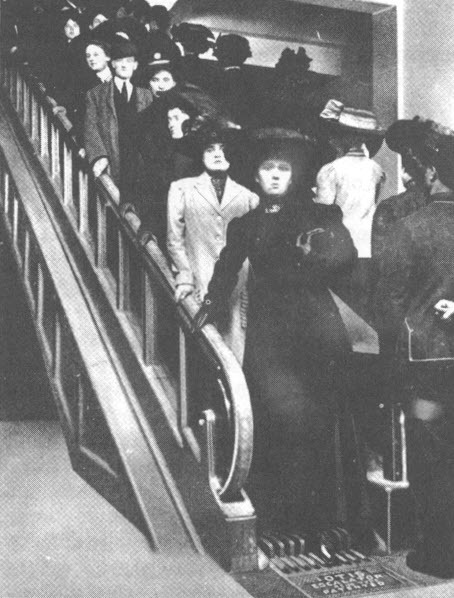 So it’s easy to see how the development of escalators contributed to the success of those first department stores by making the act of buying more convenient. One could also say the growing popularity of department stores contributed to the need to make better escalators. This all occurred before designers of shopping malls decided to hide escalators where you can’t find them and provide as few staircases as possible so you have to go out of your way, sometimes walking in circles, trying to get to the H & M down on the next level or, god forbid, find a public bathroom.